Washington, D.C., circa 1921. 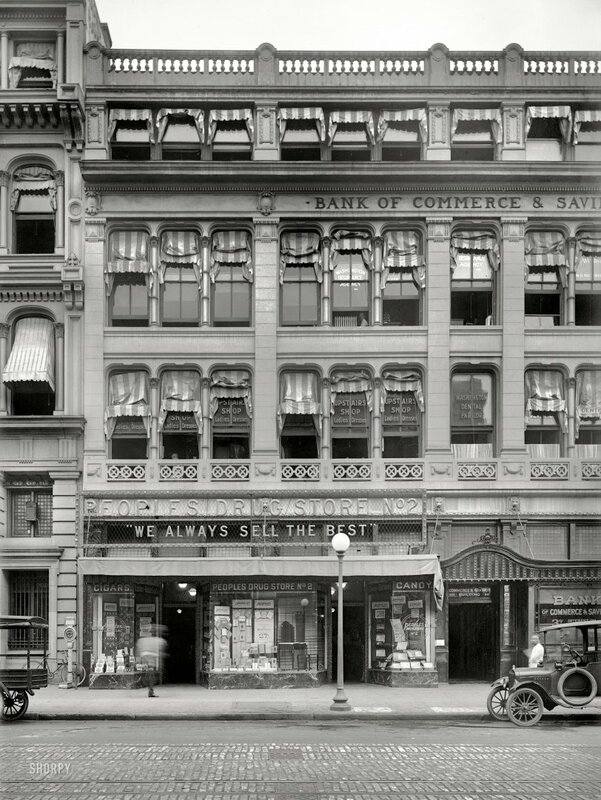 "People's Drug Store, 7th and E Sts." National Photo Company Collection glass negative. View full size. The Lions and Sashes Survived! Submitted by mistermuleboy on Mon, 11/14/2011 - 9:00am. Submitted by carolelinda on Thu, 11/10/2011 - 2:06pm. The man in the third floor window of the Washington Insurance Agency appears as if he is looking right down at the person taking this photo. I like the looks of the old building so much better. Submitted by Mr Mel on Thu, 11/10/2011 - 9:07am. Devoting a full window to cigars shows where the profits are. Submitted by perpster on Wed, 11/09/2011 - 1:43pm. Pre air conditioning, awnings were a key method of temperature control. 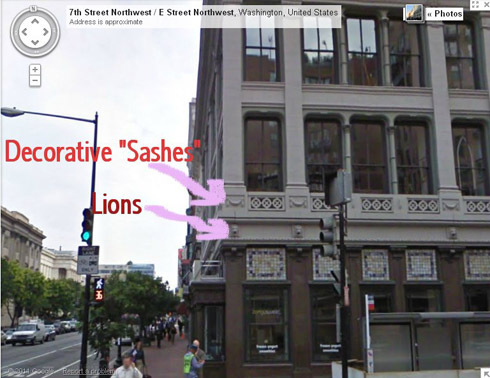 They're also a good way of identifying south-facing sides of buildings for Shorpy Detective Agency operatives. Submitted by jimchig on Wed, 11/09/2011 - 9:37am. Two Face and the One Legged Blur! Submitted by Creading on Wed, 11/09/2011 - 8:28am. This might be the first time I can remember seeing a bicycle chained to something in these early Shorpy photographs! Must be a bad neighborhood? Submitted by jsmakbkr on Wed, 11/09/2011 - 2:08am. The display windows of People's Drug Store No. 2 are certainly uncontaminated by drugs. Submitted by Jrrd73 on Tue, 11/08/2011 - 4:38pm. Still there at 7th and E, but taller. Submitted by msg on Tue, 11/08/2011 - 2:54pm. Awning sales and service must have been big business back then.